Trident gum, a popular Canadian chewing gum brand under Mondelez came up with a campaign that is as odd as it gets. They had a thought – Chewing gum helps a person relax and focus. Then they decide to go all berserk with this thought. They came up with an idea to design a clothing line that uses material which blocks radio frequencies. A piece of clothing around which technology gets disrupted and stops working. Your phones, tablets do not receive signals. Ladies and Gentlemen, introducing ‘Focus’, life gear by Trident. I’ sure somebody in the room laughed at them but they clearly couldn’t care less and went ahead with it anyway. Sometimes, you just need to be disruptive and irrelevant to break through the clutter of campaigns. 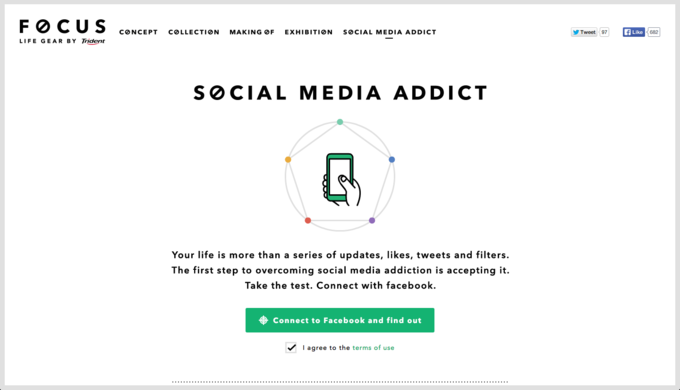 And to top it all, the company has developed an app called Social Media Addict that plugs into Facebook to determine just how “distracted” people are these days. Measuring engagement across social media, the company is looking to award someone the dubious honour of Toronto’s Most Distracted Person. OKAY THEN. There’s no explaining this idea but boy did they get the attention! Anti-wearable technology is here guys. It is. Here is an ad of the clothing line.